In addition to the Belleville city centre, the city of Belleville also comprises a number of villages and hamlets, including the following communities: Bayshore, Cannifton, Corbyville, Foxboro, Frink Centre, Gilead, Halloway, Honeywell Corners, Latta, Loyalist, Philipston, Plainfield, Pointe Anne, Roslin (partially), Thrasher's Corners, Thurlow, Thurlow South and Zion Hill. Originally the site of an Anishinaabe (Mississaugas) village in the 18th century known as Asukhknosk, the future location of the city was settled by United Empire Loyalists. It was first called Singleton's Creek after an early settler, George Singleton, and then as Meyer's Creek after prominent settler and industrialist John Walden Meyers, one of the founders of Belleville who built a sawmill and grist mill. It was renamed Belleville in honour of Lady Arabella Gore in 1816, after a visit to the settlement by Sir Francis Gore and his wife. Another important family in the growth of Belleville was that of Henry Corby, the founder of H. Corby Distillery, who had arrived in 1832. He promoted the municipality and his son Henry Corby, Jr. (Harry) donated the public library, helped develop the park at Massassaga Point, established the Corby Charitable Fund, helped raise funds to build the first bridge across the Bay of Quinte and donated Corby Park. In 1836 Belleville became an incorporated village. By 1846, it had a population of 2040. There were several stone buildings, including a jail and court house as well as some of the seven churches. Transportation to other communities was by stagecoach and, in summer, by a steamboat. Two weekly newspapers were being published. The post office received mail daily. Several court and government offices were located here. In addition to tradesmen, there was some small industry, three cloth factories, a paper mill, two grist mills, three tanneries and two breweries. Seventeen taverns were in operation. 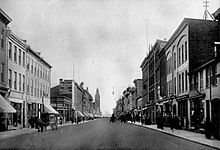 Belleville became an important railway junction with the completion of the Grand Trunk Railway in 1856; this plus a booming trade in lumber and successful farming in the area helped increase the commercial and industrial growth. Belleville was incorporated as a town in 1850. In 1858 the iron bridge over the Moira River at Bridge Street became the first iron bridge in Hastings County. By 1865, the population reached 6,000. Telephone service to 29 subscribers was in place by 1883; electricity became available in 1885 and in 1886, the town began to offer municipal water service. In 1870, Belleville became the site of Ontario's first school for the deaf. Under Dr. Charles B. Coughlin, the school was recognized as making a significant contribution to special education. Originally called the Ontario Institution for the Education of the Deaf and Dumb, the facility was first renamed Ontario School for the Deaf and then, in 1974, the Sir James Whitney School. Belleville's High Victorian Gothic town hall was built in 1873 to house the public market and administrative offices. The overall appearance is similar to the original even today. In 1877, Belleville was legally incorporated as a city. In 1998, the city was amalgamated with the surrounding Township of Thurlow to form an expanded City of Belleville as part of Ontario-wide municipal restructuring. The city also annexed portions of Quinte West to the west. The Dixie Lee Fried Chicken chain (1964) and the Journey's End Corporation economy limited service hotel chain (1978) were both founded in the city. Belleville is located at the mouth of the Moira River on the Bay of Quinte in southeastern Ontario between the cities of Quinte West to the west and Napanee to the east. These cities are connected by both Ontario's Highway 2 and the Macdonald-Cartier Freeway (Highway 401); The city is also served by Highway 37, running north-south from Belleville towards Tweed to the east of the Moira River; and Highway 62 (once Highway 14 south of 401), northwards towards Madoc, and southward to Prince Edward County over the Bay Bridge. Belleville is located in a transitional zone which may be considered part of the Central Ontario or Eastern Ontario regions by different sources. 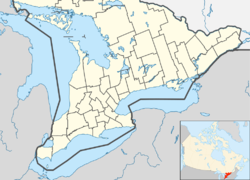 Officially, Belleville is properly considered part of the Central Ontario region as it is located west of the St. Lawrence River's starting point, but the city is popularly considered part of Eastern Ontario as it shares the eastern region's area code 613 and K postal code. Belleville's climate has four distinct seasons. The city's traditional continental climate (hot summers, cold winters) is moderated by its location near Lake Ontario. The lake moderates temperature extremes, cooling hot summer days and warming cold days during the fall and winter. As such, winter snowfall is somewhat limited due to the increased frequency of precipitation falling as rain during the winter months. In the summer months, severe thunderstorm activity is usually limited because of the non-favourable lake breeze conditions. The city, being located on the north shore of Lake Ontario, is also in an unfavourable location for lake effect snow. One notable exception however, was in December 2010 when 14 cm of snow occurred in one day as a result of a snow band from Lake Ontario. The summer months do not typically experience exceedingly hot temperatures, however humidity levels can make daytime highs uncomfortable. Summer rainfall is usually modest, and delivered by passing thunderstorms or warm fronts. Remnants of tropical systems do pass through on occasion towards summer's end, resulting in one or two days of consistently wet weather. The winter season is highly variable, with the record setting winter of 2007-08 experiencing near 270 cm of snow. Four years later, the winter of 2011-12 experienced only 60 cm of snow. Winter temperatures are also highly variable, even in one season. Air masses change frequently, and while a few days may see above freezing temperatures at a time in January, the next week may bring cold and snowfall. Autumn is usually mild, with an increase in precipitation starting in late September as conditions for fall storms develop. Recent years have had a tendency to bring almost snow free Novembers to the region. The highest temperature ever recorded in Belleville was 104 °F (40.0 °C) on 9 July, 1936. The coldest temperature ever recorded was −39 °F (−39.4 °C) on 9 February, 1934. Local government is represented by Belleville City Council with a mayor and eight councillors. There are two city wards with Ward 1 (Belleville) represented by six councillors and Ward 2 (Thurlow) by two councillors. Ward 1 consists of the historic city and Ward 2 was created in 1998 with the amalgamation of Township of Thurlow. City Council sits at Belleville City Hall. The city has their own police force since 1834, but had constables since 1790. The force has about 116 members and headed by a chief of police and a deputy chief. The service is stationed out of one location only. Policing on provincial highways are provided by the Ontario Provincial Police from the Napanee detachment. Procter & Gamble, Kellogg's, Bardon Supplies Limited, Redpath, Sigma Stretch Film Canada, Autosystems Manufacturing (Magna International), Amer Sports Canada, and Avaya (formerly Nortel) are corporations operating in Belleville. Many other manufacturing sector companies operate within the City of Belleville, including Bioniche Life Sciences, Sprague Foods, Airborne Systems Canada Ltd, Berry Plastics Canada, CPK Interior Products, Hanon (formerly Halla) Climate Control Canada, Reid's Dairy, Parmalat Canada - Black Diamond Cheese Division and Norampac Inc, just to name a few. Belleville is home to two shopping malls: The Bay View Mall in east-end Belleville and the Quinte Mall along Bell Boulevard (south of Highway 401) in North Belleville. In January 2017 a Shorelines Casino opened on Bell Boulevard. The Quinte Economic Development Commission is the regional economic development office representing the City of Belleville, the City of Quinte West and the Municipality of Brighton. The Quinte EDC is mandated with the responsibility for regional marketing for its member municipalities as well as supporting existing industries through regional strategies. The City of Belleville is located within a 15-minute drive of 8 Wing / Canadian Forces Base (CFB) Trenton. 8 Wing CFB Trenton is Canada's largest Canadian Forces Air Base and is available for commercial flights for passenger and cargo uses, by prior arrangement with DND. There is a Customs and Immigration office located on site for international flights. Airport facilities include snow removal, crash response, fire fighting and rescue services, 24-hour-a-day air traffic control tower, fully equipped airfield navigational and visual approach, and one paved runway which is 10,000 feet long and can accommodate 747 and C5A classes. Belleville is serviced by the 401 highway system, and bus service to and from Toronto Pearson International Airport is provided three times daily each way by Megabus. Deseronto Transit provides public transportation services to destinations including Deseronto, Napanee, and Prince Edward County. Belleville is located on the Toronto-Montreal main rail lines for both Canadian National Railway and Canadian Pacific Railway; both companies provide freight access. VIA Rail also operates five daily passenger services each way along its Windsor–Québec rail corridor. Highway 62 runs from the northern city limit with the Township of Centre Hastings to the southern boundary with the Municipality of Prince Edward County (where the highway crosses the Norris Whitney Bridge over the Bay of Quinte). From Highway 401 south to the Canadian National Railways overpass, 62 follows North Front Street. South of there, as that street splits entering downtown, 62 follows the eastern branch, Pinnacle Street, across the Sagonaska Bridge and through downtown. 62 then turns East at Dundas Street (old Highway 2), and continues to Bay Bridge Drive, where the highway heads south into 'the County'. Highway 37 runs from the northern city limit with Tweed south to the 401, where it is co-designated as Cannifton Road Parkway until it meets Station Street. There, it follows Station Street west to its terminus at Pinnacle Street downtown. Running across southern Belleville, Dundas Street is a four-lane highway from where it enters Belleville's west end at Wallbridge-Loyalist Road to Point Anne Road, approximately 11 km east. Highway 2 originally crossed the Moira River at the Lower Bridge, co-designated with Bridge Street, but when Dundas Street finally crossed the Moira in the early 1970s, the old route was forgotten, although it is still signed as Highway 2. The eastern section of Dundas Street is where, as Highway 2, it was rebuilt in the late 1930s as a "dual highway" (four lanes), to the same standards as the concurrent Queen Elizabeth Way. Part of a period of freeway design experimentation in Ontario, it was never upgraded in the same manner as the QEW, as Highway 2 was supplanted by the new 401 as the major transportation corridor along Lake Ontario. It remains today as an example of early freeway design. Bell in 2010 was extended east to the Moira River, where the Veterans Memorial Bridge connects it to Adam Street, with the combined route connecting Wallbridge-Loyalist Road on the western boundary of Belleville, running through the North-west Industrial Park and over the Moira as it passes through Riverside Park, ultimately ending at University Avenue, in the city's North-East Industrial Park. From Sidney Street east to North Park Street, Bell Boulevard is home to a variety of commercial properties, including Reid's Dairy and the Quinte Mall, as well as a number of restaurants and hotels. College Street runs from the residential area of West Park Village, across the city to the North-East Industrial Park. Branching off of College and running east to Shannonville Road is Airport Parkway, formerly known as the Byron Street Extension. The 1991 and 1996 populations are 44,858 and 45,069 respectively when adjusted to the 2001 boundaries. The 2001 population is 46,029 when adjusted to the 2006 boundaries. Belleville is the largest urban centre in a much larger market area generally known as the Quinte Region. According to the 2011 Canadian Census, the population of Belleville is 49,454, a 1.3% increase from 2006. The population density is 200.0 people per square km. The median age is 43.5 years old, a bit higher than the national median at 40.6 years old. There are 22,153 private dwellings with an occupancy rate of 95.1%. According to the 2011 National Household Survey, the median value of a dwelling in Belleville is $200,473 which is a fair bit lower than the national average at $280,552. The median household income (after-taxes) in Belleville is $48,552, not much lower than the national average at $54,089. Belleville is mostly made up of European descents. The racial make up of Belleville is 90.7% White, 4.4% Aboriginal (2.9% First Nations, 1.1% Metis), 1.3% South Asian and 1.0% East Asian;. Most of Belleville is either a Christian (67.1%), or affiliates with no religion (30.3%). The remaining 2.6% affiliate with another religion. The mother tongue in Belleville is primarily English (90.8%), with 1.5% French, and 7.5% as another first language. Belleville offers a number of options at the elementary, secondary, and post-secondary levels. The Academy of Learning College is a local college. Loyalist College is a local public college. The public school system is served by the Hastings & Prince Edward District School Board. The Catholic School system is served by the Algonquin and Lakeshore Catholic District School Board. The following are Belleville area schools managed by the Algonquin and Lakeshore Catholic District School Board. On September 25, 2016, the Ottawa Senators announced that their AHL affiliate will move from Binghamton, New York, to Belleville for the 2017-18 season. The team is known as the Belleville Senators. They play at the Yardmen Arena, located on Cannifton Road. Belleville was home to the Belleville Bulls of the Ontario Hockey League from 1981 to 2015. The team was then sold and relocated to Hamilton, Ontario. Belleville was also previously home to two senior hockey teams, the Belleville Macs and the Belleville McFarlands. The McFarlands won the Allan Cup in 1958, and the World Championship in 1959. Belleville is also home the Bay of Quinte Yacht Club, which challenged for the America's Cup in 1881. Belleville also sports minor hockey league teams such as the Belleville Bearcats (female) and the Belleville Jr. Bulls (male). 1Since Belleville does not yet have its own CBC Radio One outlet, the area is served by CBCP-FM 98.7 Peterborough or by a stronger signal from CBCK-FM 107.5 Kingston. On June 29, 2018, the CBC submitted an application to add a new Radio One FM transmitter at Belleville. If approved, the new transmitter will operate at 104.7 MHz which will rebroadcast the programing from CBO-FM originating from Ottawa. Lee Aaron, hard rock and jazz singer. Best known for "Metal Queen"
^ a b c "Belleville census profile". 2011 Census of Population. Statistics Canada. Retrieved 2012-02-29. ^ a b c "Belleville (Census agglomeration) census profile". 2011 Census of Population. Statistics Canada. Retrieved 2012-02-29. ^ "Armoury - Recognized Federal Heritage Building - Belleville, Ontario". Parks Canada. Retrieved 18 December 2015. ^ a b "Captain John W. Meyers 1745-1821". OntarioPlaques.com. Alan L. Brown. Retrieved April 24, 2019. ^ Sangma, Benzie. "Swing bridge changed region". The Belleville Intelligencer. Archived from the original on April 27, 2017. ^ a b "Belleville Ontario History". www.beautifulbelleville.com. ^ Smith, Wm. H. (1846). Smith's Canadian Gazetteer - Statistical and General Information Respecting all Parts of The Upper Province, or Canada West. Toronto: H. & W. Rowsell. p. 14. ^ a b "Belleville Historical Plaque". ontarioplaques.com. ^ "The Ontario School for the Deaf". OntarioPlaques.com. Alan L. Brown. Retrieved April 24, 2019. ^ "Belleville City Hall, Belleville". Ontario Heritage Trust. Retrieved 11 October 2018. ^ "Belleville City Hall". OntarioPlaques.com. Alan L. Brown. Retrieved April 24, 2019. ^ a b c "Belleville, Ontario". Canadian Climate Normals 1981–2010. Environment Canada. Retrieved April 9, 2014. ^ "Daily Data Report for January 2013". Canadian Climate Data. Environment Canada. Retrieved 24 July 2016. ^ "History of the Belleville Police Service" (PDF). Belleville Police Service. October 25, 2010. Retrieved 16 November 2018. ^ "Transit". deseronto.ca. Town of Deseronto. Retrieved 11 October 2018. ^ "Ontario Highway 2 Photographs - Page 9 - History of Ontario's Kings Highways". Thekingshighway.ca. Retrieved 2014-06-13. ^ "National Household Survey (NHS) Profile, 2011". 2.statcan.gc.ca. Retrieved 2014-06-13. ^ "2006 Community Profiles - Community highlights for Clearview". 2006 Census data. Statistics Canada. Retrieved 2010-12-15. ^ Andrew Foote (26 September 2016). "Senators moving minor league team to Belleville, Ont". CBC News Ottawa. Retrieved 26 September 2016. ^ "Cultural Exchange Committee". City of Belleville. Retrieved 18 December 2015. ^ Ciarula Taylor, Lesley (2012-05-03). "Cheezies inventor dies in Belleville, Ont., at 90". Toronto Star. Retrieved 2012-05-15. ^ "New Miss Universe studied in Ont". Cnews.canoe.ca. 2007-05-29. Retrieved 2014-06-13. Wikimedia Commons has media related to Belleville, Ontario.